The political parties in Congress are increasingly polarized in ideological terms. This is largely driven by replacement rather than adaptation; that is, moderates are increasingly leaving Congress, and being replaced by ideological extremists. The plot below shows the difference between the Republican and Democratic party medians using Poole et al’s common space NOMINATE scores, for the 103rd (1992-1993) through the 112th (2011-2012) Congresses. Under this common measure, a larger gap between the centers of both parties indicates a greater level of polarization. Both House and Senate are polarized (the distance is greater than zero), and they are getting more so over time. 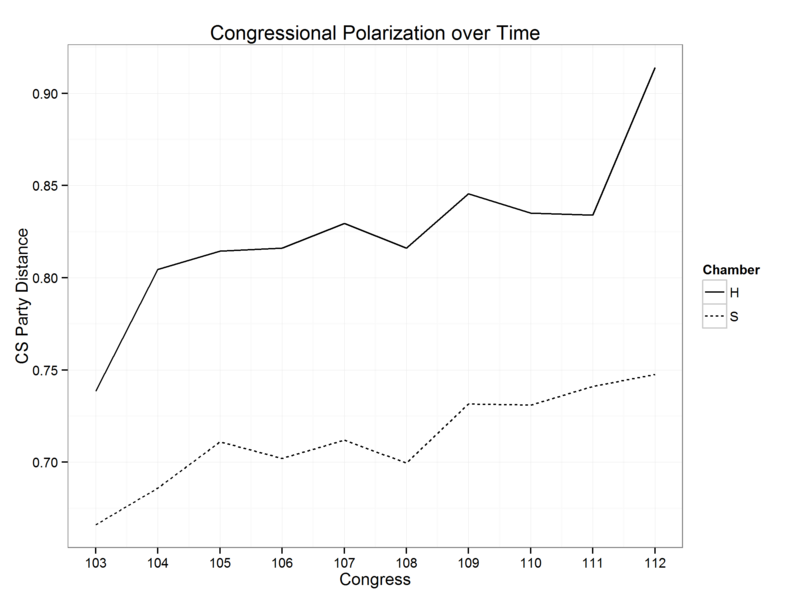 The US House in particular is both more polarized in terms of level and polarizing faster in terms of trend relative to the US Senate. What about American state legislatures? It’s important to nail down these numbers because we need to know where we stand to find out if polarization is leading to political gridlock and dysfunctional policy. We also need a barometer of polarization to find out whether reforms like opening up primaries, taking redistricting away from politicians themselves, term limits, and so forth can do anything about this yawning gap between the parties. And since there are 50 state legislatures, we might find answers to these questions more quickly and definitively than we can with Congress, of which we only have one. 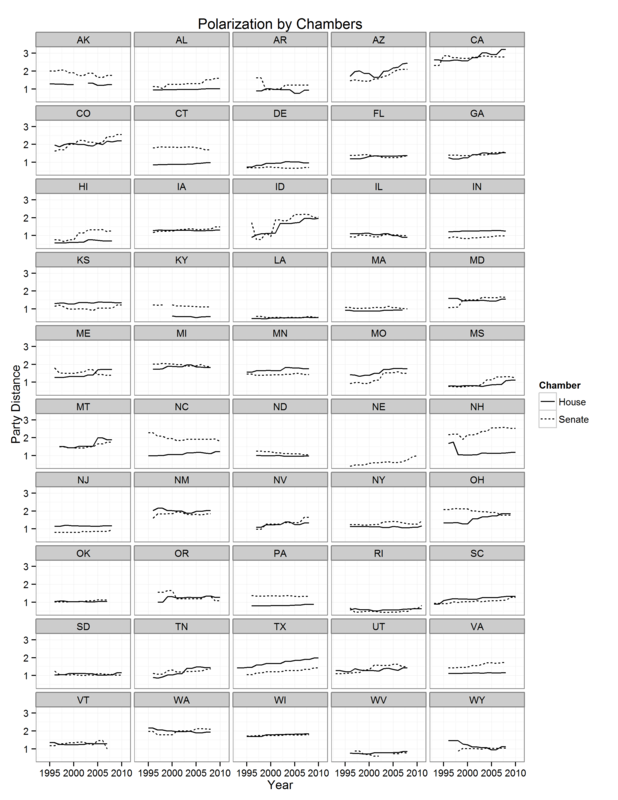 Earlier in this blog I showed evidence that most state legislatures are in fact quite polarized, and a significant number of them are even more polarized than Congress. The data underlying these figures can be found here, and the paper explaining how Nolan McCarty and I came up with the numbers can be found here. Now we’ll take a more detailed look at the state polarization trends for all 50 states over time. The plot below shows the distances between the party medians for all 50 states over approximately the same time period, roughly 1996-2010. As with the US Congress, all 99 state legislative chambers (Nebraska has a single chamber commonly referred to as the Unicam, which I term a Senate here) are polarized. In 59 of those 99 chambers, the parties are getting more distant from each other. In 16 of them, the parties are actually depolarizing or getting closer. Finally, in 24 chambers, the parties are roughly stable in relation to each other. However, in most states, unlike in the US Congress, the upper (Senate) chamber is typically more polarized than the lower (House or Assembly) chamber. On the other hand, the lower chamber is polarizing faster in more states than the upper chamber. It is not yet clear why these differences should exist. The top 10 fastest polarizing chambers, in order, are the Idaho Senate and House, the Missouri Senate, the Arizona Senate, the Hawaii Senate, the Colorado Senate, the Tennessee House, the Nevada Senate, the Maryland Senate, and Mississippi Senate. At the same time, California retains its title as the most polarized state legislature in the country. It has even managed to move up a couple of notches in the past 15 years. Another notable state is Nebraska, whose Unicam is amongst the fastest polarizers in the country, despite the fact that it is nonpartisan by law in the chambers and at the voting booth. Seth Masket and I show in a paper how parties in the state have overcome this powerful prohibition to work as cohesive, disciplined units–just like other states. But which parties are driving this polarization at the state level? Are both parties at fault, or is one becoming more extreme compared to the other? That is, is state legislative polarization symmetric or asymmetric? I will tackle this subject in my next post. Interestingly enough, a few state chambers are actually depolarizing: the parties are actually coming closer together. The fastest depolarizing state chambers, in order, are the Wyoming House, the Oregon Senate, the Alaska Senate, the Ohio Senate, and the North Carolina Senate. This is completely unheard of in recent years in Congress. NB: The scales of the two plots aren’t comparable because they are taken from two separate data sources. However, in technical terms, they are both common space measures which disallow individual legislator ideological drift in order to facilitate an apples-to-apples comparison. This entry was posted in Ideology, Parties, Polarization and tagged political gridlock, state legislatures on July 26, 2013 by Boris Shor.